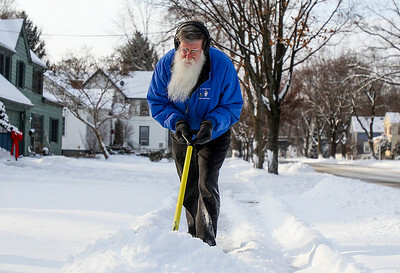 Sarah Nader- snader@shawmedia.com John Vanantwerp clears his sidewalk in Algonquin Monday, December 9, 2013 after McHenry County had its first significant measurable snowfall of the winter season. The National Weather Service in Chicago recorded 3.1 inches of snowfall at O’Hare International Airport Sunday and some weather spotters reported more than 4 inches of snow in McHenry and Crystal Lake. 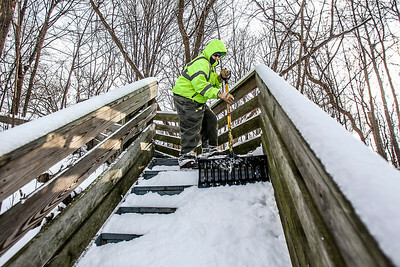 Sarah Nader- snader@shawmedia.com Mark Trebes with the McHenry County Conservation District clears steps leading to Prairie Trail in Algonquin Monday, December 9, 2013 after McHenry County had its first significant measurable snowfall of the winter season. The National Weather Service in Chicago recorded 3.1 inches of snowfall at O’Hare International Airport Sunday and some weather spotters reported more than 4 inches of snow in McHenry and Crystal Lake.